With the US libertarian presidential candidate pushing double-digits in the polls for the first time in history, many are starting to take former New Mexico governor Gary Johnson’s policy ideas seriously. While signing books at the libertarian Freedom Fest conference, Johnson said he was “open” to the idea of a Universal Basic Income (UBI). Like many libertarians, Johnson said he liked the idea of the UBI because of its potential to save money in bureaucratic costs, freeing up more money to give people directly. During the exchange, we discussed how directly giving a basic income would increase the value of each dollar spent for the recipient, as opposed to in-kind services, such as food stamps, which restrict purchases. At the same time, I asked Johnson about his position on the carbon tax and using these funds to fund the basic income. He once again said he was “open” to the idea. “There are a lot of smart libertarians that support the carbon tax, so I don’t discount the idea,” Johnson said. 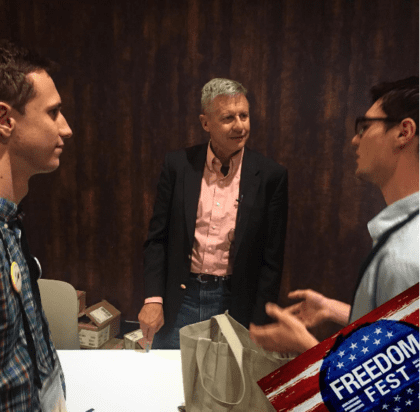 Johnson was attending Freedom Fest in Las Vegas to discuss term limits and answer questions about his candidacy with his running mate, former Massachusetts governor William Weld. He is currently polling around 13 percent against Donald Trump, Jill Stein, and Hillary Clinton. As long as Libertarians like Johnson advocate Austrian economics and the Gold Standard the UBI can never be more than a zero-sum game that restricts growth and begs for politically damaging levels of income redistribution. Proponents of the UBI need to be supporting alternate economic theories such as Modern Monetary Theory for which Bernie Sanders’ main economic advisor, Prof. Stephanie Kelton, is a major proponent. UBI is just another income redistribution scene. I’m surprised that a Libertarian can’t see through this. These egg heads keep messing around with economic systems that have failed when we have one that works and has been working for thousands of years. Free Market. Johnson does not support the gold standard, or Austrian economics. How is UBI any different than minimum wage? Do you get UBI even if you don’t work? Yep, the idea is that everyone gets $X/month just for being alive. It is superior to the minimum wage because it doesn’t increase the cost of hiring for employers. or government issued currency as the NEED act spells out. That’s a good question. What would the rules and regulations be? Would such a program promote people having more children? Especially when we don’t need to increase our population? Would these monies be in addition to what one is paid for work or would everyone receive the same amt each month whether or not they chose to work? Ooooor would everyone over a certain age be required to work? And what about the physically and mentally disabled?